Knowing how to attract nesting hummingbirds can help you entice these flying jewels to raise their delicate families in your yard. This can give you an unparalleled opportunity to witness the birds’ amazing growth and the nurturing a hummingbird mother offers her chicks. To make your yard attractive to nesting hummingbirds, however, it is important to understand what the birds need to nest and how to make your yard a safe place for baby hummingbirds. Hummingbirds are not cavity-nesters and will not use birdhouses, no matter what the dimensions, shape, or color of the house. Instead, hummingbird nests are built out of a variety of materials including moss, lichen, plant down, feathers, and spider silk. Depending on the hummingbird species and the general climate, a nest may be used for just one brood or for several broods in the same season, but nests are not frequently reused from year to year. If your yard is safe and attractive, however, you can easily encourage hummingbirds to nest nearby for many years. Food: Nectar-producing flowers and hummingbird feeders are great options, but also avoid spraying for spiders or other insects. Spider silk is a critical material for building hummingbird nests, and insects provide necessary protein for the mother bird to feed her growing chicks. Shelter: Hummingbirds may seem to be always on the go, but adequate perching spots and sheltered trees and shrubs will help them feel safe and secure. Plants that provide shelter from the sun, wind, and rain are also ideal spots for a hummingbird nest. Thorny plants are another great option that can provide protection from hummingbird predators as well. Water: Hummingbirds prefer misters and bubblers for water sources, and providing one or more of these in your yard will make the area more attractive. Ideally, position a mister or dripper so the water collects on a broad leaf, and hummingbirds may rub against the leaf for a quick bath. Red: Hummingbirds are attracted to bright colors like red, so plant red flowers and add a red gazing ball or other decorative accents to your garden to catch their attention. Other bright colors, such as orange, pink, or purple, can also help attract hummingbirds. Even the most attractive yard can still be unsafe for these tiny birds, and a dangerous area is not a place where hummingbirds will choose to nest. 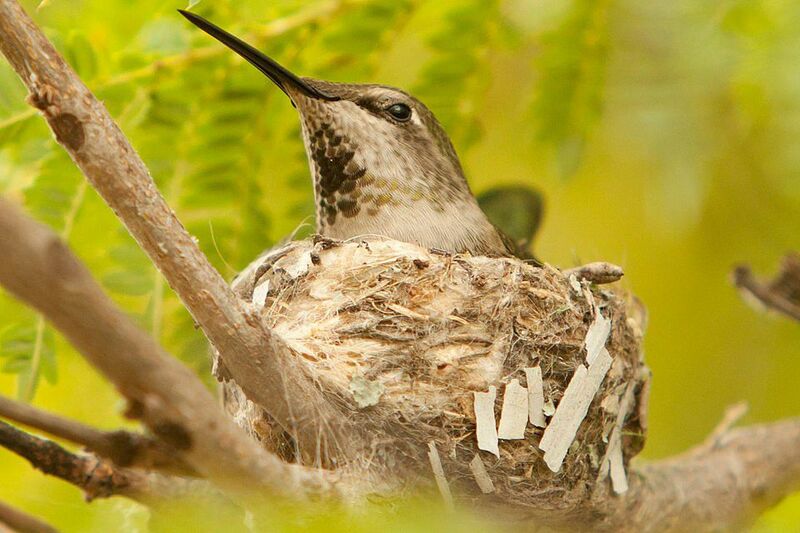 Fortunately, there are easy steps to take to keep your yard safe for nesting hummingbirds. Avoid competition from too many feeders. While having one or two hummingbird feeders will provide needed nourishment for the birds, too many feeders will attract a large crowd and can discourage nesting. Similarly, avoid too many feeders for other bird species that hummingbirds would see at threatening, or position feeding areas well away from prime nesting spots. Avoid using pesticides or insecticides. Not only will these products eliminate necessary food sources, but the toxins can be deadly to birds. Similarly, avoid spraying too many chemicals, including fertilizers and herbicides, on the lawn or garden. Any chemical buildup, even if the chemicals are intended to be beneficial, can be harmful to these tiny birds if the chemicals are applied incorrectly. Control insects around hummingbird feeders and flowers. Small insects can be a nutritious meal for hummingbirds, but wasp or hornet nests can be dangerous for these tiny birds. Praying mantises can also attack hummingbirds, so relocate these large insects away from hummingbird-friendly areas. Control predators in the yard. Cats, dogs, snakes, and other predators threaten nesting hummingbirds. If signs of predators are evident in your yard, hummingbirds will avoid the area when they look for nesting sites. Offer nesting material such as natural cotton fibers in dedicated hangers. Put hummingbird feeders out early to attract the first seasonal migrants. Minimize yard activities in spots where nests are likely to avoid disrupting birds. Remove flowers hummingbirds don't like and replace them with nectar-rich blooms. Above all, be observant. Hummingbird nests are well-camouflaged and can be difficult to see. If you suspect you have a nest nearby, watch for the female to eat and track her back to her nest, taking care not to disturb her or her chicks, and enjoy the experience of watching the world’s tiniest birds hatch and grow.